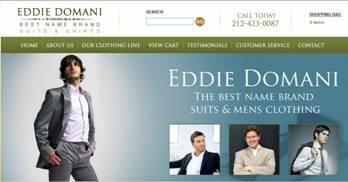 Eddie Domani sells the best name brand suits and other men’s clothing at low and discount prices. With the Ecommerce web design by Bitochon this New York-based company can do business 24 hours a day and seven days a week. Furthermore, the online store has enabled the company to expand its customer base and introduced them to a bigger audience. Visitors to the site can view merchandise, use the shopping cart and make purchases with a credit card. The site features an easy-to-use administration interface so that revisions can be made to content as needed. The site also features a description of the company, testimonials and a customer service page. The easy-to-use administration interface allows revisions to be made to content as needed.